This one caught our attention at Costco. The sell sheet on the table indicated it scored 98 points! 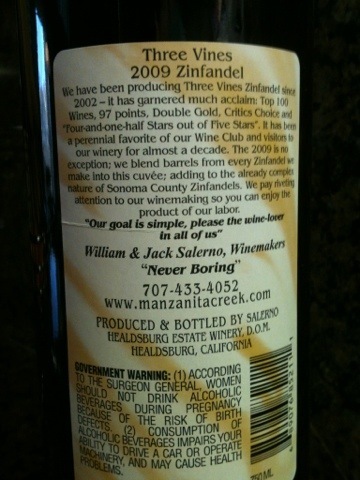 Wow, $12.99 a bottle and 98 points, gotta try this!?! Glad we did. When you first open the bottle the peppery, plum aromas definitely come out, in fact I wondered how this could score a 98. We decanted it about 30-45 mins and it made a big difference. This cuvée from Sonoma County Zinfandels will not disappoint. While it would be hard pressed to score a 98 in my book it is a strong thexprt 92. For $12.99 a bottle we will definitely be buying more than a few more bottles.